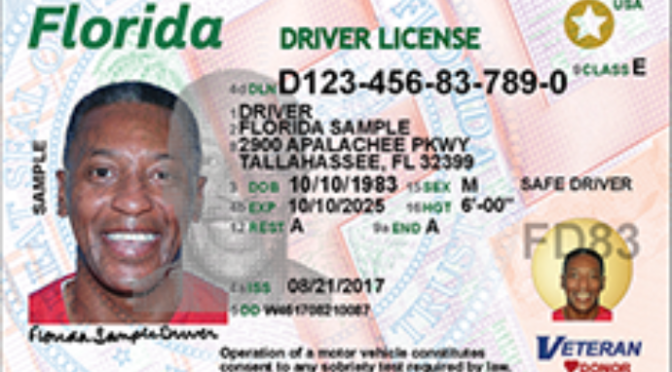 This month, the Florida Department of Highway Safety of Motor Vehicles released new driver’s licenses and ID cards. The department describes the new cards as, “the most secure over-the-counter credential on the market today.” Specific security features include multiple details that glow under ultraviolet light. You can get markers on your driver’s license that indicate if you are deaf/hard of hearing, if you are an organ donor, if you have a hunting or fishing license, and if you’re a veteran. You cannot, however, get a marker on your driver’s license that indicates that you have a developmental disability. That marker is only available on non-driver ID cards. In December, when the developmental disability designations first rolled out, the department claimed that the lack of availability for driver’s licenses was only temporary. “[It] will go into effect once the redesigned Florida driver license is implemented,” department spokesperson Beth Frady told the Orlando Sun-Sentinel last December. It is still not possible to get a developmental disability marker. When NOS Magazine reached out to the department for comment, Deputy Communications Director Alexis Bakofsky said that the developmental disability designation is not available on driver’s licenses because Florida state law does not require it. The statute cited doesn’t say that the marker can’t be put on a driver’s license. It only specifies that the developmental disability marker can be put on “identification.” Driver’s licenses are generally considered a kind of identification. Sometimes, interactions with law enforcement are relatively benign misunderstandings. For example, Mark Schicker, a man with cerebral palsy from West Bend, Wisconsin, has been pulled over numerous times, to the point he feels he is being harassed. When people see him driving, they often assume he is drunk. Despite a decade of being pulled over and local complaints, he’s only been found to be in violation of the law three times. “We’ve never found him to be intoxicated while driving,” Capt. Toby Netko, of West Bend Police Department told WISN, a local ABC affliliate. It is possible that a developmental disability marker could help Mr. Schicker in this situation, although it seems unlikely – the local police department already knows who he is and that he is disabled. Sometimes, police interactions with developmentally disabled drivers are more deadly, particularly if that driver is a person of color. Disabled people in general are three times more likely than their nondisabled peers to face police violence. This is especially true for disabled people of color. Many black drivers, disabled or not, have been shot before they even had the opportunity to show identification to police. Keith Lamont Scott, for example, was shot while reading a book in his car. Jordan Edwards, a Texas teen, was killed while driving away from a party. Philando Castille was shot when he went to take out his driver’s license as instructed by the officers who pulled him over in the first place. It is, unfortunately, unclear if developmental disability designations on licenses will help prevent police violence against disabled people. One thing is certain: Developmentally disabled drivers exist. Regardless of efficacy, if there are developmental disability ID markers, they should be available to developmentally disabled drivers who want them too. Disabled people, especially disabled people of color, face danger in police interactions. Whether they are driving or not doesn’t change that.